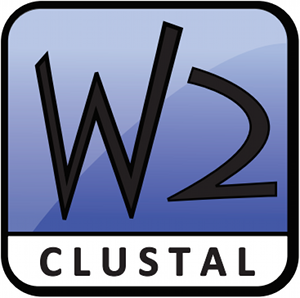 Clustal W is a general purpose multiple sequence alignment program for DNA or proteins.It produces biologically meaningful multiple sequence alignments of divergent sequences. It calculates the best match for the selected sequences, and lines them up so that the identities, similarities and differences can be seen. Evolutionary relationships can be seen via viewing Cladograms or Phylograms. Clustal omega is the latest version of Clustal, but is available for command line/web server only. For more information regarding Clustal Omega vs. ClustalW.